VedicMaths.Org - 12 - Left to Right or Right to Left ? The flexibility of the Vedic system is such that it is frequently possible to calculate from left to right or from right to left. Basic arithmetical calculations are normally only done from the right - with the exception of division which is done only from the left. Being able to work from either direction adds to the flexibility and gives choice to the students. But there are many advantages in working from the left. 1) We get the most significant figures first: if we are working with large numbers and we need only the first two or three figures of the answer we would be doing a lot of unnecessary work if we start at the right. 2) We pronounce numbers left to right and numbers are written left to right so it is more natural to work from the left; it is certainly easier for mental calculations. 3) Sometimes there is no last figure to start from: in finding square roots and sines and cosines there is no last figure so we must start at the left. 4) In working from left to right we find we can easily combine calculations so that, for example, we can find the square root of the sum of two squares in one line. Since in most Western countries we generally pronounce and write numbers from the left but calculate from the right it would be worth knowing if there have been any studies into cultures where the calculation normally proceeds in the same direction as the numbers are pronounced and written. Does anyone know of any such study? Through correspondence with Sue Clear in Oxford, England another interesting point has arisen because the units column in a place-value system does not have to be on the right: the units could be on the left and the tens to the right of that and so on. Are there any cultures where this is found? And are there any advantages to having a system where the units are on the left? There are quite a few possibilities here. Please let us know your thoughts and observations. Motilal Banarsidass, the Indian publishers who published the original work by Sri Bharati Krsna Tirthaji in 1965, are publishing a series of titles under the heading "India's Scientific Heritage". The General Editor will be Dr L M Singhvi. 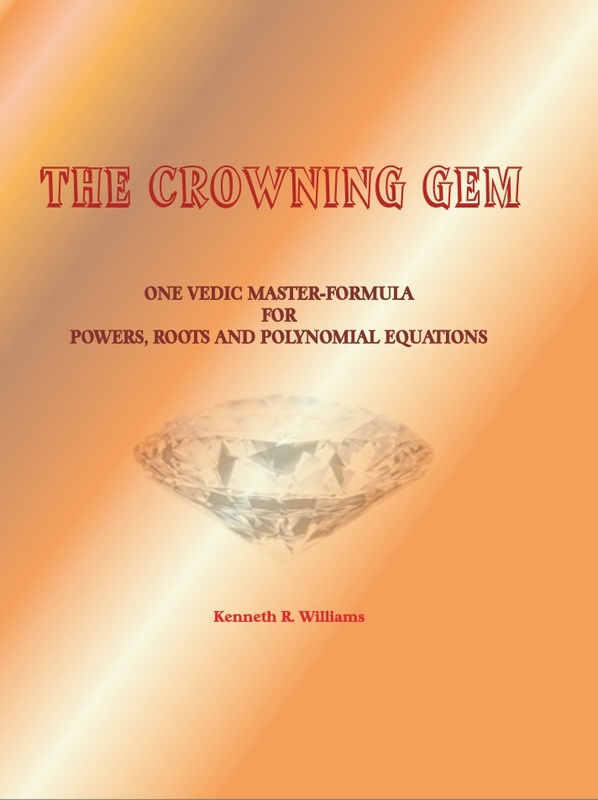 The first in this series will be Tirthaji's book, the second "Vedic Mathematics for Schools 1-5" by James Glover, the third will be "The Cosmic Computer" course (under a new name), followed by "The Natural Calculator", "Triples", "Vertically and Crosswise", "Asronomical Applications of Vedic Mathematics" and further books and other subjects are planned. This is a big step forward as it means that some of the books formerly published by Inspiration Books will soon be available at very reasonable prices. Inspiration Books will therefore probably be wound up then. The Division of Continuing Education will offer a five-lesson course on Maha-rishi's Vedic Mathematics in November taught by Associate Professor Ashley Deans, physicist and director of Maha-rishi School, and Mac Muehlman, whose Ph.D. dissertation was on Vedic Mathematics. This will be at Maharishi University of Management at Fairfield, US. The course fee is $87. Maharishi School parents may take the course at the special rate of $75. The course will meet five Wednesday evenings, starting November 8. There won't be class on Wednesday, November 22. More detials on the Calendar on the web site. There is a 1-day workshop organised by Motilal Banarsidass on 3rd November at Indraprastha College for girls and a series of 3 or 4 workshops are planned in Gwalior, Madtya Pradesh. An introductory 12 week course on Vedic Mathematics started on 16th September in Manchester, England. More details on the Calendar on the website. This began on 9th October with 45 students and runs for 10 weeks. More details on the Calendar on the web site. This took place on 7th September at Manchester Metropolitan University and was very successful. The course was given by Dr George Joseph, Ann Brierley and Kenneth Williams. About 25 Primary School teachers took part and found the Vedic system would be very useful in their teaching. Further events are being planned as a result. A series of seminars took place at Skovde University, Sweden from 24th to 26th October. These were extremely well received and Kenneth Williams who gave the courses was asked (but declined) to stay longer so that more events could be organised. There were courses for teacher trainees ('fantastic" they said), teachers of young and older children and one for schoolchildren (one boy jokingly said he was thinking of suing the school). In every case the Vedic system was appreciated for its unified structure, beauty and simplicity. There are very likely to be more courses there next year. "GEOMETRY FOR AN ORAL TRADITION" For those who buy this book through the internet (at www.vedicmaths.com) a special price now applies of 15 pounds (previously 20 pounds). Thank you to those who found and sent the sources of unsolved problems requested in the last Newsletter. Apparently there are at least six web sites with Vedic Maths names which have been purchased but not used. Either some people are taking a long time to prepare their VM site or such is the anticipated popularity of Vedic Mathematics that people are buying the domain names in order to sell it later for a profit. A number of links have been put into our web site to newspaper articles on Vedic Mathematics that can be viewed on the web. If you know of any that are missing please let us know.